Caldwell, New Jersey: Western Essex County's only Restaurant Week is returning to one local borough in August. The third annual Caldwell Restaurant Week will be held from Sunday, August 7th to Sunday, August 14th at businesses along the Bloomfield Avenue corridor in Caldwell, such as Xunta - Tapas España, Asalt and Buttery, and Gelotti. A full list of participating restaurants will be released in the near future, and many will offer prix fixe menus and specials. Bloomfield, Montclair, Maplewood, South Orange, and Newark also hold restaurant weeks. 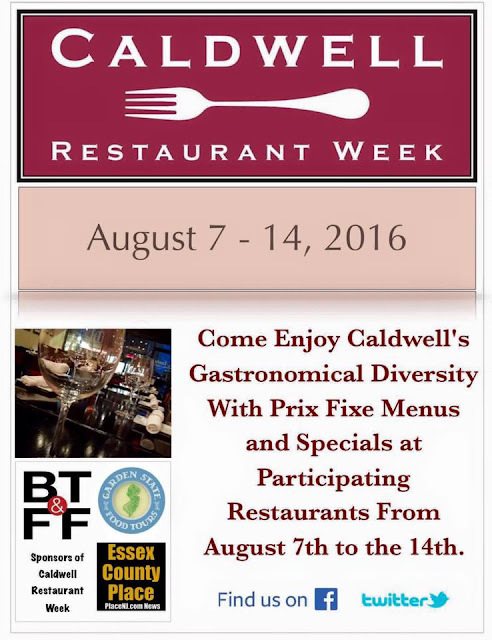 Essex County Place is a media partner of Caldwell Restaurant Week, as are Garden State Food Tours and Black Tie & Flip Flops. Fairfield, New Jersey: Construction is continuing on two new Wawa locations in Essex County. Wawa, which is based in Delaware County, Pennsylvania, will open gas stations and convenience stores in Fairfield and Maplewood. Maplewood's Wawa location, first announced at the beginning of 2015, will be located at the corner of Springfield Avenue and Jacoby Street, at the site of Maplewood Plumbing Supply, a parking lot, and an additional building. An additional entrance on 45th Street is planned. A 'coming soon' sign for the Wawa was recently added. The Fairfield Wawa will be located at 387-389 Passaic Avenue, at the southwest corner of Little Falls Road, near Route 46. It will be built alongside a new Chase Bank location by J&J Development Group. The Fairfield Office Center was previously located at the site. Although there are locations in neighboring Morris, Hudson, Bergen, and Union Counties, the new locations will be Wawa's first in Essex County. Essex County has recently seen an increase in the development of convenience stores. In fact, the Fairfield Wawa will be located just across the street from a QuickChek store and gas station that opened at the end of last year at the site of an Exxon station, and the Maplewood location will be one block away from a QuickChek store. In the past five years, competitor 7-Eleven has opened stores in Maplewood, South Orange, Livingston, East Orange, and Newark. Wawa did not respond to requests for comments as to when the locations will open. This photo shows the view of Maplewood Middle School from South Mountain Reservation. Newark, New Jersey: As local officials prepare for the expansion of Riverfront Park in Newark from the Ironbound through Downtown, input is wanted from members of the public. Currently, the park, which is managed by Essex County, consists of 12 acres along Raymond Boulevard in the Ironbound with athletic fields, walking trails, a dock used for boat tours, and playgrounds. Under the new project, Riverfront Park will be expanded to the Bridge Street Bridge in Downtown Newark. It will pass the Jackson Street Bridge and Newark Penn Station, and will be built adjacent to McCarter Highway/Route 21. It will include the trail near the FBI's Newark office. Pedestrian and bicycle pathways, benches, a boathouse, athletic fields, habitat areas, a new floating dock, a stage, an amphitheater, exercise courses, fitness equipment, playground equipment, restroom facilities, and decorative fences are planned for the expanded park, according to a legal notice. Now, the Newark Community Economic Development Corporation and the City of Newark have created the Newark Riverfront Park Pre-Design Survey to gather feedback from the community. Questions range from 'What is your greatest ambition for the Newark Riverfront?' to 'Which area of the Riverfront has the most potential?' to 'What features would you most like to see along the Riverfront?'. Orange, New Jersey: A new store is planning to open soon in Downtown Orange. OG Sole will open a location at 214 Main Street in Orange, between Brook Alley and South Center Street. According to the business Instagram page, the new store will hold a grand opening on Saturday, July 16th. A variety of clothing and sneakers will be sold at the business, and a sneaker arcade, screen printing, and embroidery will also be available on site, according to OG Sole. Previously, OG Sole was located along Route 17 in Paramus, Bergen County. The building that OG Sole will occupy in Orange was built in 2014, and the space was previously occupied by Jewelry Depot. A building that stood at the site containing Milan Couture and Bebe Nails Salon was demolished in 2013. Newark, New Jersey: A building in Newark's East Ward which is being redeveloped could receive a tax abatement. Essex County Place first reported in January that the building located at 118-134 Adams Street, between Lafayette and Ferry Streets, will be converted into a mixed use residential and commercial building. The building stretches to Jackson Street, the next block. According to a Newark Central Planning Board agenda, the project will include 28 apartments on the upper floors and six retail spaces on the first floor. The H. E. Rainaud Company, which manufactured lamps, used the building as a factory until 1919, when it moved its operations to Connecticut. The Flexible Cork Company also operated a factory in the building, as did a furniture company. The building is known for the American flag painted on its side. Now, according to a legal notice, developer Beacon Redevelopment Urban Renewal Company could receive a 15-year tax abatement from the City of Newark. The first reading of the ordinance which would allow the tax abatement was passed by the Newark Municipal Council on June 15, and could be finally approved at the meeting on July 7. According to the City of Newark, businesses receiving tax abatements in the city must pay an annual service charge instead of property taxes. A bird is seen leaving a tree in this photo taken at South Mountain Reservation in Millburn. Newark, New Jersey: A building in Newark's East Ward may soon be considered by the City of Newark to be a historic property. According to a legal notice, the Dietze Building, located in the Ironbound at 60-64 Union Street, between Ferry Street and Hamilton Street, is in the process of being designated as a historic landmark by the Newark Landmarks and Historic Preservation Committee and the City of Newark. Originally built in the 1890s, according to the notice, the Dietze Building, which is four stories tall, was reconstructed in 1927 for the Dietze Realty Corporation by architect Charles F. Ackerman. It is currently used for residential and artist spaces. Local artist Anker West applied for the historic designation in 2014, the notice reports. According to Old Newark, the Kirchhof Patent Company once operated a toy factory in the building, and a 'ghost sign' advertising novelties can still be seen outside the building. The Newark Municipal Council passed the first reading of the proposed historic designation on June 15 and will vote on the final reading on July 7. The Union County Courthouse in Elizabeth can be seen from South Mountain Reservation in Millburn. Newark, New Jersey: A Newark-based company which has torn down several buildings to make way for parking lots may be planning to convert an existing building into a new development. Edison Properties, which owns the ParkFast chain of parking lots, has created a website regarding its plans for the 109-year-old Newark Warehouse Company Building, also known as the Central Graphic Arts Building at 98-126 Edison Place. The building, located at the corner of McCarter Highway near Newark Penn Station and the Gateway Center, will be located alongside the new Triangle Park, which will connect the Prudential Center with the Ironbound. “Triangle Park could be a very important exciting thing as the center of activity in Newark", Edison Properties owner Jerry Gottesman told NJBIZ. The website shows plans for a sports complex, office and retail space in the existing building, and shows ten floors of residential space that could be built on top of it. "The Newark Warehouse Co. will be the future home of residential and office suites, arts and entertainment venues, retail businesses and restaurants", the website states, adding that "we are bringing all of these entities under one roof to foster a healthy, urban vibe in Newark and help the city attract young professionals looking for a 'cooler' alternative to Hoboken and Jersey City – with better transportation options". NJ Parcels reports that an organization registered to the same address as Edison Properties acquired the building for $7,000,000 from the Berkowitz Company in 2014. Over the years, Edison Properties has demolished many buildings across the City of Newark. In 2013, the company tore down the former TAP Air Portugal Building on Market Street, which was where the Children's Museum of New Jersey was slated to open. A ParkFast lot sits at the site now. In addition, Barry Carter of The Star-Ledger has reported how the company has expanded parking lots without permission of the Newark Zoning Board of Adjustment. Across Edison Place from the warehouse, another new development could be coming. Signs posted at 769-781 McCarter Highway advertise that up to 500,000 square feet of mixed use retail and office space could be coming to the site of a parking lot, which sits at the corner of Market Street. The property was sold by the Newark Housing Authority to Newark Plaza Urban Renewal, which is located within the same address as Boraie Development, in 2012. Edison Properties and Boraie Development have not responded to several requests for comment. Newark, New Jersey: The next episode of FRONTLINE on PBS will be about the Newark Police Department. 'Policing the Police' will air nationally on Tuesday, June 28th. Locally, it can be viewed WNET 13 at 10:00pm. It was produced by James Jacoby and Anya Bourg, and will feature Jelani Cobb of The New Yorker. The film's trailer describes Newark as "one of the most violent cities in America", and includes scenes shot at a meeting at Newark City Hall, an arrest outside of Norfolk Liquors at the corner of Norfolk and New Streets, and interviews with NPD officers. KPBS reports that the film "gives viewers a raw and complex look at the challenge of changing how cops operate in a place like Newark". The station says that Mayor Ras Baraka is interviewed in 'Policing the Police'. The release of the film comes after The Newark Police Department's Civilian Complaint Review Board (CCRB) was unanimously approved by the Newark City Council in March following its 2015 creation by Mayor Ras Baraka under executive order. Several residents, in addition to representatives from the Ironbound Community Corporation, Newark NAACP, American Civil Liberties Union of New Jersey (ACLU of NJ), New Jersey Red Umbrella Alliance, and Newark Communities for Accountable Policing (N-CAP) spoke before the council at that city council meeting. At the time, James Stewart Jr., the president of the Newark Fraternal Order of Police Lodge 12, which represents NPD officers, told Essex County Place that "we will move forward, along with the Superior Officers Association, and challenge the CCRB on its merits in any available forum, including Superior Court, to determine what actions are allowed by a New Jersey CCRB, and what actions are not". Bloomfield, New Jersey: A Hudson County restaurant is planning to open a second location here in Essex County. Satis Bistro's new restaurant will be located at 289 Glenwood Avenue in Bloomfield, between Conger Street and Washington Street. According to a post on the restaurant's Facebook page from owner Michael Fiorianti, Satis Bistro of Bloomfield "will have a liquor license and offer a wide menu of wines and drinks to satisfy all palates and budgets". Currently, Satis Bistro operates one location in the Paulus Hook section of Downtown Jersey City. The Jersey City restaurant opened in 2010, and serves a variety of items for brunch and dinner, from tortilla espanola and buttermilk cornmeal pancakes to broccoli risotto and cast iron roasted half chicken. The Bloomfield space used to be occupied by El Chirripo Restaurant, and the surrounding area of Bloomfield Center has seen significant revitalization, with several large new mixed use developments opening in the past five years. A Jack's Super Foodtown supermarket opened across the street from the space within the Avalon Bloomfield Station last year. This photo shows the Bramhall Terrace overlook at South Mountain Reservation in Maplewood. This photo shows one of the several trailside art projects within trees in the Millburn section of South Mountain Reservation. This photo was taken outside of the Millburn Free Public Library. Irvington, New Jersey: Supermarkets are returning to two Essex County townships. Pathmark's locations at 115 Belmont Avenue in Belleville's Silver Lake section and 471 Lyons Avenue in Irvington closed in 2015 when parent company A&P filed for bankruptcy. The Belleville space, located just down the street from the Silver Lake Station on the Newark Light Rail, and the Irvington space, located near Route 78, had been vacant since the Pathmark stores closed. Now, new supermarkets will occupy the spaces. According to the company website, Key Food is opening a SuperFresh Food World location in the Belleville space. In addition, the Irvington space will be occupied by a SuperFresh. The SuperFresh name was purchased from A&P by Key Food in February, according to Supermarket News. Last month, a SuperFresh Food World store opened in the former A&P space at 19 Belleville Avenue in Bloomfield, and Fine Fare is currently operating a market in the former Food Basics space on Main Street in Belleville. The former Pathmark location at the corner of South Orange Avenue and Bergen Street in Newark still remains vacant. An employee of the Bloomfield location told Essex County Place that the Belleville store will open on July 1st. UPDATE: The SuperFresh locations have opened in Belleville and Irvington. Newark, New Jersey: The lease for a new Newark Police Department facility will begin next month. According to a legal notice, Broad Street Fidelco will lease the space on the first floor of the recently expanded building at 494 Broad Street, near Riverfront Stadium between Bridge Street and Atlantic Street, for $1 per year, beginning on July 1. The space will be used as a Central Ward mini-precinct, and the lease lasts for three years. A parking garage, a Cablevision call center, and News 12 New Jersey's Newark Newsroom are also located in the building. Newark Communications Director Frank Baraff told Essex County Place in April that the Internal Affairs Division of the NPD will also be located in the space. In addition, police office space is planned for the One Theater Square development near the New Jersey Performing Arts Center, in addition to 245 apartments and retail space. This photo shows the view of Newark, Irvington, and New York from South Mountain Reservation in Maplewood. Valley Fair and the Dairyland Milk Bottle in Irvington can be seen in the foreground, and apartment buildings in Coney Island, Brooklyn can be seen in the distance. This photo shows a FedEx plane taking off from Newark Liberty International Airport, as seen from Crest Drive in Maplewood. The Verrazano-Narrows Bridge can be seen in the distance. UPDATE 7/6/16: According to Essex County spokesperson Anthony Puglisi, Turtle Back Zoo in West Orange is no longer planning to bring in California condors, and Andean condors will remain. West Orange, New Jersey: A new exhibit is planned for Essex County's only zoo. The Turtle Back Zoo, located at 560 Northfield Avenue in West Orange, is planning to install a California condor exhibit. According to the West Orange Township Department of Planning and Development, the township's Planning Board will review the proposal at its next meeting on July 6th at 7:30pm. Essex County spokesperson Anthony Puglisi told Essex County Place that design of the exhibit just began, and that construction could begin in October. The exhibit will be located between the bison exhibit and the penguin exhibit, according to Puglisi. According to National Geographic, "the California condor is the largest flying bird in North America". The Turtle Back Zoo used to be home to an Andean condor named Claudia, but KTVU FOX 2 reports that it was relocated to the San Francisco Zoo earlier this year. Zoos in San Diego, Portland, and Los Angeles currently feature California condors. County officials announced earlier this month that a sea turtle recovery center is also coming to the Turtle Back Zoo. This photo shows the former Lighthipe's Quarry in Millburn, which operated in the early 20th Century. Newark, New Jersey: One of the restaurants considered to be part of Newark's revitalization is planning to close. According to Nation's Restaurant News, Joe's Crab Shack is closing locations in urban areas, including its restaurant in Downtown Newark. A location in the Bronx will also be closing, and the New York Post reports that the company's restaurant in Harlem was recently closed. “We’re committed to the Tri-State area, especially New Jersey", company president Jim Mazany told The Star-Ledger when the Newark restaurant opened. However, Robert Merritt of Ignite Restaurant Group reportedly said at a conference last week that the location will close within the next few months. Newark's Joe's Crab Shack location opened near the Prudential Center and City Hall within the Courtyard by Marriott hotel at 860 Broad Street less than three years ago. All of the other storefronts within the hotel have remained vacant since it opened in 2012. Representatives from Joe's Crab Shack did not immediately return requests for comment. Newark, New Jersey: Redevelopment plans for the New Jersey Bell Headquarters Building in Downtown Newark are moving forward. Essex County Place broke the story in April that Verizon New Jersey, which owns the historic 87-year-old building, is selling it for $16,510,000. It is listed on the National Register of Historic Places. Verizon was originally planning to sell the building in 2008, but stayed after receiving over $20 million in tax breaks from the State of New Jersey. Now, the project, which calls for 267 residential units on the upper floors of the 21-floor building, in addition to retail space on the first floor, a gym, and a fitness center is set to be heard by the Newark Central Planning Board on June 27th at 7:30pm at City Hall. According to a legal notice, Verizon will continue to occupy a portion of the commercial space for offices and a switching center. CetraRuddy will be the lead architect and designer of the project, according to Interior Design Magazine. 540 Broad Street Owners LLC is the project developer, along with Prudential and L+M Development Partners. This photo shows a view of Downtown Newark from Beaver Street. This photo shows the Agnes Varis NJTV Studio at Newark's Gateway Center. This photo shows the development of the Hahne's complex in Downtown Newark as seen from the Rutgers-Newark campus. Newark, New Jersey: Three politicians who are part of New Jersey's congressional delegation will attend a rally in Newark on Monday. Senator Bob Menendez, Senator Cory Booker, and Representative Donald M. Payne, Jr. will urge "New Jerseyans to rally behind common sense solutions that reduce gun violence" on Monday, June 20th at 11:30am, according to Representative Payne's office. The rally will be held on the steps of Essex County Courthouse, located at the corner of Market Street and Springfield Avenue in Downtown Newark. Victims of gun violence, in addition to community leaders, are also slated to attend. South Orange, New Jersey: A new parking garage has opened for South Orange residents and commuters. According to the South Orange Parking Authority, the garage within the new Third & Valley complex opened today. The entrance is located on Third Street opposite Sloan Street, near the South Orange Train Station. An email sent to residents states that residents with valid Garage permits can begin parking in the Garage starting Monday, June 20th, and that Resident Garage permit parking is reserved from 5am - 11am. The garage is attached to the Third & Valley building, which contains over 200 apartments, a pool, and retail space. It was built at the site of the former South Orange Rescue Squad headquarters and two commuter parking lots. This photo shows the vintage Mueller Bros. sign along Central Avenue in Newark. This photo shows a view of South Orange and West Orange from the Columbia High School observatory in Maplewood. West Caldwell, New Jersey: A Western Essex County car dealership is planning to relocate into another town. Mercedes-Benz of Caldwell, currently located at 1230 Bloomfield Avenue in Fairfield, is proposing to move down the street to 1220 Bloomfield Avenue in West Caldwell. The company, which is Essex County's only Mercedes-Benz dealership, has applied to the West Caldwell Township Planning Board to tear down the existing building at the site in order to build a new structure. Clairmont Cadillac previously operated in the building, which is located on a six acre property. Currently, the parking lot of the West Caldwell building is being used for vehicle storage. This photo shows the First Presbyterian and Trinity Church in Downtown South Orange. This mural on Academy Street in South Orange is located near the original site of Columbia High School. Newark, New Jersey: The landscape architect who designed the High Line park in Manhattan will also design the expanded Riverfront Park in Newark. Now, the city has announced that James Corner of Field Operations will be the lead designer landscape architect for the next phases of the park. According to the City of Newark, Corner's projects have included the High Line in Manhattan, the Race Street Pier in Philadelphia, and Freshkills Park in Staten Island. Mayor Ras J. Baraka and other city officials will hold a press conference tomorrow regarding the project. Newark, New Jersey: Vigils will be held today and tomorrow throughout Essex County to honor the victims of a mass shooting in Orlando, Florida on Sunday. According to Newark Senior Press Information Officer David Lippman, a vigil hosted by Mayor Ras J. Baraka and the City of Newark's Lesbian, Gay, Bisexual, Transgender, and Questioning Commission will take place tonight at 6:00pm on the front steps of City Hall. City Hall flags will fly at half mast, and residents are welcome to participate in the vigil. "I urge all of Newark to join me at this vigil in sending our condolences and support to the victims, and a firm message to the world: Newark stands opposed to gun violence, homophobia, and bigotry", said Mayor Baraka in a statement. In addition, the Township of Maplewood and the Township of South Orange Village will hold a joint vigil on Tuesday, June 14 at 7:00pm at the Sloan Street Gazebo in Downtown South Orange, outside of the main South Orange Train Station. Photo: The final project of art history students at Columbia High School in Maplewood is on display on the school's clock tower. It can be viewed at 17 Parker Avenue. Short Hills, New Jersey: A national candy store brand will open its first New Jersey location in Essex County. A Sugarfina store will be located within The Mall at Short Hills. According to the mall website, it will operate in the lower level near Macy's. Sugarfina describes itself as "a luxury candy boutique for grown-ups", and the company sells a variety of chocolates, gummies, licorice, and marshmallows. Currently, there are locations in California, Georgia, Massachusetts, Texas, New York, and Illinois. In addition, Ce Ce Co, which sells children's clothing, is planning to open a store on the mall's lower level. Orange, New Jersey: Another new mixed-use development could be coming to the City of Orange Township. According to a legal notice from the Orange Planning Board, Canfield Developers is planning to construct a new four story building on a lot near 12-20 Canfield Street, just off of Main Street in Downtown. The lot where the building is slated for is currently wooded and vacant. Should it be approved, the project will include 30 residential units on the top three floors and retail space and 20 parking spaces on the first floor. The notice states that the new building will be connected to an existing 88-year-old apartment building at 12 Canfield Street with 17 apartments using a new stairwell. According to NJ Parcels, Canfield Developers purchased the properties last year for $1,000,000. A public hearing regarding the proposal will be held at City Hall on North Day Street at 7:30pm on June 22.